One by one, the countries of Europe are losing their ability to sell their bonds at an interest rate that is sustainable for their economies and revenue bases without severe and socially disruptive restructuring, even if a central bank that will accommodate their spending by printing money or other countries will tax their citizens to pay for someone else's debts. The US will soon be faced with that same problem if we do not act soon. Will it be 2014? 2015? 2016? I think it will be earlier rather than later, as the bond market will look at Europe and what will soon be an imploding Japan and decide that the US is only different in size and scale. The interest on the debt is a growing part of the overall budget, and any rise will put severe constraints on spending or force large tax increases or require the Federal Reserve to monetize the debt. None of those have positive outcomes. Ignored long enough, it will bring about another Depression. This week we will explore some options to actually resolve the deficit and debt crisis. Cutting spending or raising taxes have consequences, but not all cuts and not all taxes are the same. For those who have been wanting more specific solutions from me, I am going to address the issues surrounding taxation and offer my thoughts as to what we should do. Let's see how many friends and readers I can upset this week. And I close with a few brief thoughts on writing, the coming employment crisis (will two billion jobs really disappear? ), and advice for younger readers. Before we dive in, I want to respond to a lot of letters and blogs about last week's letter, which also handily works as a preface to this week's musings. There were a lot of comments pro and con about my thoughts on various historical events. In quick review, I offered numerous thought experiments about what would have been different economically following a presidential election if their opponent had won. It was mostly an alternative-history type of speculative process. There are whole book series written with such a premise. What would have happened if the South had won the Civil War or Germany World War II? Total speculation as to the details, open to much disagreement. And disagreement there was over certain interpretations of history. Would Al Gore (or pick your alternative president) have done certain things differently? Possibly, and maybe even probably. Such speculations are totally open for debate. But nearly all disagreements missed my main point, which was (and is) that presidents take the credit for good economic times and get blamed for bad times, when the reality is that they don't have all that much control over the economy, especially in their first four years in office. They take the oath of office and their first budget isn't even offered until 13 months later and then maybe adopted later in their second year, with lots of changes. With lots of compromises. Hardly time to radically affect the economy by year four of their term. Some changes? Yes, of course. But the main direction is already set, and they are really affecting the future more than their present time. I argued that you really have to go back to Reagan to get serious change of direction, and even then you can argue that it was Carter that appointed Volcker (though I doubt he thought Volcker would create a major recession in an election year). Does anyone really think Reagan wanted a second double-dip recession in his second year in office? The legacy of Reagan was just beginning in 1984, and I will argue below that it was the restructuring of taxes in 1986 that provided the largest and most lasting contribution in terms of economics. "This (upcoming) election is ultimately about dealing (or not dealing) with the deficit, and putting the country on a path to a sustainable budget deficit, one that is less than the growth rate of the country. As I have argued elsewhere, and will argue in future letters, that is the paramount issue. Not dealing with the deficit runs the very real risk of the bond market treating us just as it is treating Italy and any other country that gets to the point where its debt is unsustainable. Not this year or the next for the US, but almost certainly before 2016. And once the bond market loses faith in a country, it takes a massive restructuring to restore that confidence. And we can see how that is playing out in Europe. "The next president must have the ability to get a consensus. Let me shock a few of my fellow Republicans and say that I think the deficit is such a deadly disease that it would be better for the country for the Democrats to be in power and forced to deal with the situation than to do nothing. I would not like their solution, and I think it would be harmful, but not as harmful as a second Depression, brought on by not dealing with the deficits and entitlement problems. "As a businessman, I would rather pay higher taxes on profits than to have no profits at all. Just tell me the rules and I will figure out how to adjust. A Depression 2 would mean 20% unemployment (at least) and a real lost decade, with the Boomer generation trying to figure out how to deal with no money and no jobs and being old. "And the choices we would be forced to make? The spending cuts would be far deeper than anyone can now imagine, and the taxes needed far greater. Think what happens when any country has hit that debt limit. Greece is not having fun. And either Italy is going to be unhappy with the longer-term recession it will have, or Germany is going to be unhappy with the ECB backing Italian debt at below-market rates for a long time, which means printing money and a much lower euro. Actually, I think both must happen if the euro is to remain a viable currency. That's just what happens when you don't deal with deficits before they become a problem. If Italy is to remain in the euro, there must be a back-door bailout by the ECB, accompanied by Italian austerity (is that an oxymoron?). And don't forget Spain. "What would the Fed do in such an event? Does it succumb to the worst fears of the Austrian economic crowd and monetize the debt in an effort to fight deflation and depression? Does it trash the dollar and make gold bugs happy? Or does it find its inner Bundesbank (Austrian) core and eschew the easier way out, forcing the federal government to cut spending and raise taxes while interest rates are rising? "This is a question to which we do not want the answer. Whether it's yes or no, the answer is a disaster. Just choose the form of disaster you prefer. To the unemployed, retirees, and the young, it will make little difference. Ask our grandparents (or my father and mother), who lived through the Depression. "And doing nothing will mean that we find the answer to that question. The very answer we want to never know in real life. It makes for interesting speculation now, but living through it will be hell." The growing debt and the deficit is a deadly cancer on the economy. It will deliver a mortal blow to the economy if not dealt with. As I recently experienced in my family, it is better to deal with a cancer as soon as possible. Putting off treatment will not make the cancer go away by itself, and the cancer of our debt is clearly growing and malignant. It will soon overwhelm our national economic body. But dealing with a cancer is not without cost and pain, whether on a real personal level or a metaphorical national level. The problem is solvable. It is not that there are not a lot of solutions. It is that we have not yet found the political will to decide what course of treatment is needed. Let's start with a few basic presuppositions that I think must be addressed in order to marshall an effective set of choices. It has to be politically feasible. The Right would like to address the problem with spending cuts and reforms. Reforms and spending cuts are necessary but not sufficient to deal with the problems. For instance, disability payments are now running $200 billion a year and growing rapidly. Some 25% of those unemployed since the beginning of this crisis have somehow qualified for disability payments. We can cut the time allowed for unemployment benefits, but that does not offer large numbers. Government transfers now account for 22% of household income. Cutting that will be politically difficult. The real problem is health care. How much do we want and how do we want to pay for it? Health care must be thoroughly reformed, but the will (the votes) to go back to the 1990s is just not there. Rising costs can be controlled but not eliminated. The same goes for Social Security. We can raise the retirement age, do means testing, and make other changes; but the fact is that there are more Baby Boomers retiring each year. There is no Social Security Trust Fund. The money was spent on other projects, and now Social Security runs in the red each year. What Republican is running on a platform of taking away Social Security from those who are presently receiving it or will be eligible for Social Security within 10 years? Want to cut defense? Military pensions? Government pensions. And the Left wants to solve the problem by raising taxes on "the rich." We are down well over $1 trillion a year in our deficit. Obama's new plan raise taxes a lot and still has $1.3 trillion in deficits, with very rosy assumptions. "According to the New York Times, the president's plan to abolish the Bush tax cuts for those making more than $250,000 is expected to bring in merely $0.7 trillion over the next decade, or about 0.4 percent of Gross Domestic Product per year [about $60 billion in the coming years, under optimistic projections that assume higher growth and no recessions]. As a comparison, the Congressional Budget Office estimates that the deficit over the same period is going to be $13 trillion, more than 6 percent of GDP per year. The hard reality is that the rich just don't make enough to cover our current deficit. If we raised taxes to something like 60% on the top 10% of income earners, not just the 1%, we might get enough tax revenue, if the "rich" cooperated by making the same income they do now. That type of tax rate is just not politically feasible under any conceivable elected Congress. It will require both spending cuts AND different and higher forms of revenue to get a deficit reduction plan through Congress, even a majority Right or Left Congress. If Obama could not get higher taxes (except for health care in the future) in his first two years, with a decidedly Democratic Congress, it is very unlikely to happen in time to deal with the deficit crisis. Something must be done SOON. We don't have another five election cycles to debate this. We have unfunded liabilities that simply cannot be paid under any tax scheme. Those promises will not be kept, because we will not have the money in future years, and it gets worse with each passing year. Tax rates matter to the growth of the economy. Even a low estimate of the results of raising taxes by 10% reduces GDP by about 0.4% of the increase in taxes. There are studies by very credible economists of both political parties, which I have written about in detail, that show that tax cuts and increases have a multiplier of as much as 3, as to their effects (Romer, as an example). An average estimate would give you something like a multiplier of 2. I have read no studies based on actual statistics and not some untested theory that suggests that taxes have a neutral effect. To suggest taxes have no effect on the economy makes for good sound bites and is nice in theory, but the studies of actual statistics simply do not support that idea. Increasing the taxes on the rich may be "fair," but it is not GDP-neutral. Kennedy, Reagan, and Bush cut taxes, and the economy grew and more taxes were collected in total within a few years. But we are no longer able to cut marginal income tax rates and borrow to pay the deficit, waiting for growth to happen to make the cuts "pay for themselves." We have simply borrowed too much. We are close to the limit. We must find other options. Some taxes appear to have less effect on economic growth, although I cannot argue that we have enough data points or serious academic studies to prove it. Reagan cut marginal income tax rates in 1986, but paid for it by getting rid of numerous tax deductions; so the overall affect was revenue-neutral, but the economy sure did grow after that. People (at least US citizens) clearly adjust their spending, investments, and incomes in response to marginal income tax rates. I am not arguing "fair share" or the morality of income distribution, simply observing a fact. The principle is if you want more of something, then lower the taxes on whatever it is, and vice versa. If you want to increase overall national income (again not talking about the fairness or how it is distributed), then tax it less. This idea is not radical. Rather, it is well accepted by nearly all political types. Congress (both parties) has passed over 3,000 laws giving tax breaks to encourage certain types of economic behavior they deem to be good. Mortgage interest-rate deductions, charitable deductions, tax breaks for married couples and children, and so on down to very minor and industry-specific breaks. They all assume that taxes affect behavior. Some level of government spending is necessary, although what is necessary by one person's lights may be seen as a waste by another. But governments should provide for the common need what a free market would not do. Defense as an example. Is health care a common right? A majority of voters certainly think so. Education? Roads? Regulations on certain industries? Again, a serious majority of voters think so. One might argue for something less, and certainly Ron Paul does so rather well, with a growing following over the years I have known him; but such a vision is not politically feasible in the next four years. There are some ideas that are fundamental to the growth of the economy, capitalism, and free markets as we know them today. Thomas Hobbes argued that income measures what you contribute to society and spending measures what take from it. Adam Smith argued that it is the wealth of nations and not the wealth of governments (or kings) that matters. His idea was that it was more important to grow the economy than the government. Without economic growth the average person will be left worse off. If our population grows 1% a year, then if GDP does not grow by 1%, there is less for each person to share. And private-sector growth is what is needed for general prosperity. Notice in the chart below (courtesy of Rob Arnott and Research Affiliates) that private (non-government) GDP has not grown for well over 10 years. This is about the same time period in which wages and private incomes have been flat. There has to be growth in the private economy (in total) for those employed in the private economy to make more money (in total). Keynes did indeed argue that deficit spending was a good thing in recessions. But he also assumed that the debt would be paid back in the next growth cycle. We forgot that latter part and now must deal with the consequences. I am not going to argue here how we should spend the tax revenues. I am simply going to suggest how we might collect them with as little negative impact as possible. That is not to argue there will be no impact. Taxes have consequences. I will confess I found a great deal to not like about the recommendations of the Simpson-Bowles deficit commission (and the other private bipartisan proposals). But if I were a Congressman and Simpson-Bowles was put in front of me, with my choices being yes or no, I would have voted for it in a heartbeat and tried to get enough votes to "fix" it later. There is NO bipartisan compromise solution that will make any of us happy in its details, no matter what your political views. That is why it is called a compromise, and that is what is needed. Never let a good crisis go to waste. The tax code as it currently stands is just unworkable. There are too many special interests and it is too complex. It assumes government knows best how to allocate capital by all the "tax expenditures" (tax breaks) that are in it. Let's use this crisis as a perfect time to radically reform the tax code. So let's get down to details. I met with Marc Sumerlin for breakfast a few weeks ago, and he later sent me a book he coauthored back in 2007 with Larry Lindsey, called What a President Should Know … but most learn too late. Both men are serious economic thinkers, and Lindsey is a specialist in tax policies. They both worked as economic advisors in the White House, and Lindsey was on the Board of Governors of the Federal Reserve. They do understand some of the mechanics of politics and economics. They now work together at The Lindsey Group, an economic advisory service based in DC. They do excellent work. Marc outlined to me their thoughts on reforming the tax code. I read the chapter in the book on reforms, and like it better than anything else I have seen. What they suggest is to tax consumption with a 20% Value Added Tax (VAT). There would be no taxes for incomes under $100,000. None. No Social Security. No Medicare. If you make less than $100,000 you pay nothing. All income over $100,000 is taxed at 20%, no matter what the source. No capital gains rate or dividend break. I assume that also means no municipal bond exemptions. No exemptions for anything. Every last tax expenditure goes away. Corporate tax rates would be 20%, and again I assume no exemptions. If you make a profit, you pay taxes. Although they did not say it in the book, they essentially agree with Hobbes that income measures what you contribute to society and spending measures what you take from it. What society wants (and needs) is more income, as that grows tax revenues and general wealth. Consumption – what you get from society – is taxed. We don't just need to tax millionaires more, we need more millionaires that we can tax. And you get that by encouraging growth in the economy. They also note that their proposal was revenue-neutral in 2007, and included a $2,000 per child tax credit. Every worker would get an approximate 7.5% pay raise from the removing of Social Security and Medicare taxes. While businesses would also get that same tax break, they would have to pay a VAT on salaries, which would be an increase in cost. Welfare, the social safety net, and health care would all be funded. As the VAT would not be paid on exports, it would put us on a more even ground with those nations that have a VAT and certainly lower business taxes, both of which would make us more competitive and increase exports and thus employment. While they did not suggest it, I would change the tax code over four years, although phasing out tax expenditures faster to help the current budget crisis. A sudden change might be disruptive, and it would take time to get the mechanism in place for collecting a VAT. States with individual income taxes would need to adjust the sources of their incomes. (It would also give my tax-accountant and tax-lawyer friends time to find a different career focus.) Businesses would need some time to adjust their costs and sales. This is different from the so-called "Fair Tax," which is essentially a national sales tax. While I like the idea of taxing consumption, a 20% sales tax on top of state and local sales taxes of 8-10% would encourage much of our economy to move to either a barter system or a cash economy. A VAT might provoke similar reactions on a smaller level, but I think overall it is more readily collectible. One can adjust the levels of both the VAT and income taxes to match the desired level of government spending. I might prefer less, but that is not the point here. Match these taxes (along with the normal excise taxes) with entitlement reform, a properly structured health-care system, and some cuts in other areas, and you are close to a balanced budget. One caveat. It may surprise a few readers, but I met with David Krone yesterday for a long breakfast in Washington, DC. David is chief of staff for Senate Majority Leader Harry Reid. He is passionate, articulate, savvy, and an all-round nice guy. We found many areas of common ground and concerns. When I broached the idea of the tax proposal above, he seemed open to it, but came back with one thought. "It has to have a trigger." I must admit, I had to ask what a trigger is. "A trigger is a pre-agreed-upon outcome if the desired budget outcome does not happen. Either spending cuts, tax increases, or some combination, but it must be automatic." Quite a reasonable suggestion. I readily admit there is something for everyone to hate in a VAT tax. It would raise my costs for employees substantially. I would lose several nice deductions. But given our current tax code, I think it would be the better of two evils for the economy. Do you hate the idea? Then come up with an alternative that collects enough revenue and doesn't have the problems of the current structure, and can get the votes. As I noted above, I would vote for something like Simpson-Bowles if that was my choice. I think Reid and Boehner should introduce Simpson-Bowles for an up or down vote before the next election. Let's see what happens. I want to thank all of my readers who sent me very kind notes about my daughter Melissa. As you might have read here, she had her thyroid removed last week, along with some rather large growths. We were quite worried. It turns out that a very small part of the tumor was actually malignant, but it was totally surrounded by benign tissue, and all the growths were removed. The doctor tells us if we had waited a year it would have spread and become a real issue. A random test looking for something else led to the discovery. We were very blessed to catch it very early. We will of course pay attention, but it looks like Melissa dodged a very large bullet. "But Dad, how can I do that? I don't have any experience or education for that." Writing and marketing happens to be something I know a little about. I pointed out that normal university education is not necessary to be a writer. Like any craft, it is one of those things that you have to do in order to learn it. And the more you do it, the better you will get. As Malcolm Gladwell says in The Tipping Point, practice something for 10,000 hours, whether it's playing music (as the Beatles did) or writing software (as any number of successful entrepreneurs did, long before they became rich and famous), and you can get good. Rarely can you just get lucky. That is not the real world. As the saying goes, the harder you work the luckier you get. I often get asked by young people how they can become a writer. My answer is that you start writing. Put it out there. Keep writing until you develop your own voice and style, and then keep on writing some more. I look back at what I was writing 40 years ago and it is embarrassing to me now, although at the time I thought I was rather clever. (Ah, the hubris of youth.) My early offerings of this e-letter, which are still posted, make me cringe when I get up the nerve to go back and read them. Not the actual ideas and forecasts, but the writing style. Even so, over time, people responded and forwarded them and the subscriber base slowly grew. I must admit to still being amazed at it all. When I left college I wanted to be a writer. And after 40 years, I think I am getting there. I have never found writing easy. It is hard work. But I hope in ten years my writing will be better than it is today and that I will still have an audience. I never take for granted that you will still be here with me, taking your precious time to spend a few minutes with me at the end of the week. But I write with the same audience in mind today that I did when I started this letter. In my mind, when I write, it is to a small group of friends like you. That is just the way I write. Not better than any other style, just me. So that is what I told Melissa, along with a few other insights here and there. "If you want to be a writer, then write." Of course, it helps to have some understanding of techniques from people with experience. If you want to learn to write persuasive copy, then there are places and people who can help you. I know of a number of people who have gone to the Copywriting Program created by American Writers and Artists, and went on to successful careers writing marketing copy. Randomly, there is a small, intensive workshop next week for web copywriting, a little advanced for a beginner, but I'm sending her because I think it is best for her to just plunge in. There are a few spots still open. You can learn more about it here: www.awaionline.com/web-intensive. Writing is not brain surgery. You can become a professional by just writing. If you wait until you think you are an expert, you will never get started. Melissa can go back and take some of their other programs to help, but the key is to start writing. While she has the basic talent (at least Dad thinks she does) it takes a lot of work to get to where people will pay you for your efforts. I will help, of course. And frankly, it is a lot less than a college degree would cost, so if she can do it it will be a good investment for me. One less cost center (we love our children but they can be cost centers for longer than we would like to admit) and hopefully one more adult launched into the world, on her own, doing what she wants. You can sign up for American Writers and Artists' free letter, The Writer's Life (which sounds easier than it is but is a lot of fun) at www.awaionline.com/signup/the-writers-life/. I will let you know from time to time how Melissa is doing. But for this week, Dad is content that she is healthy, as happy as I have seen her in a long time, and has a new focus. Life doesn't get much better than that. And in closing, I'll mention that I read a report by Thomas Frey that over 2 billion jobs will disappear as new ones appear. I don't know about his numbers, but I do know the world is changing rapidly. I think about that a lot. "The secret of lifetime success in your career is to combine a core skill with new marketing techniques. Your markets will change. But if you can reach customers by means of a core skill, you will improve your output. You will stay ahead of the competition. "If you plan to be in the labor market in a decade or half a century from now, you must begin to adjust to the reality that is 120 years behind us already. The cost of information will fall next year and the year after. This is a good thing for us as customers. It can be painful news for us as producers. "This is why we must continually work on our core skills. We must match these skills with the market. We must pay attention to what customers want, why they want it, at what price, in what quantities, and in what format. This is the law of the free market: customers' authority. They can change their minds at any time. You had better perceive how and when they will do this, and then be in front of them at the time when they pull out their credit cards. "Work on your core skill. Work on your marketing. You are in the business of selling yourself. Do not take this task lightly." I hope to get my kids to read and heed those words. It is late and time to hit the send button. If you are in the US, enjoy your long President's Day weekend. Feb. 27, 2012, 1:31 a.m. The Lindsey/Summerlin book had only 4 reviews on Amazon one each 5,3,2, and 1 star so evidently it was not a best seller so Summerlin probably had lots of copies left over. The good news is I can get it used for a penny plus 3.99 shipping so I will buy it. I am intrigued by these VAT and FAIR tax ideas. I wish you or one of your staff had read the whole book and not just the chapter on reforms. I got a call from one of Senator Burr’s staffers last week and he mentioned the Fair Tax and I called it a VAT, but sent an apology since I found out from reading here that I was wrong. Senator Burr and I are NOT on first name basis, but I subscribe to his newsletters since he is one of my senators. I often sound off and disagree with him, which must be why the staffer called. I hardly hear from our Democratic Senator, but I must admit I do not write her as much. I guess I need to do that. Feb. 24, 2012, 4:27 p.m.
Feb. 22, 2012, 1:13 a.m. I haven’t read the article this week, but only scanned the parts pertaining to taxes. In addition, I have had a couple glasses of wine. For the two of you still reading, here is my comment. I have had many jobs in my life. I have worked with my fellow humans, fellow Americans in many different settings, and in not just a few of those jobs, among the lower rungs of society. I have observed that 95% (or more) of those fellow humans work diligently, even work hard, and expect to do so every day, every year, for all of their working career. They want a house, a life, a family, at least a modest representation of the “American Dream”. A few of them will become (or already have become) entrepreneurs. Maybe 5%? 10%? maybe more. But the majority will not strike out “on their own”; they will be employees, and by and large, pretty damn good ones from what I have seen. Americans taken as a whole are hard working people who will work every day for decades to try to achieve a modicum of the “dream”. They can’t, and won’t all be “entrepreneurial”. There has never been, and will never be such a country. You know this. We know this. The ideology of the current right wing is designed to achieve nirvana for the few as detailed in the paragraph above listing the wet dreams of the “intellectually sophisticated” thought leaders such as Mr. Mauldin. I often read Mr. Mauldin’s newsletters, and probably will continue to do so. But when reduced to simpler language, and for the 80% or more of all us Americans, living our lives in America, the core meaning of what is actually being said is just BS, and a scam. Feb. 21, 2012, 11:15 p.m.
Well, where to begin. I agree with your premise that we need to reduce our deficit and get our financial house in order. But I have a very hard time accepting some of statements. In general you made reference to the multiplier effect of raising or lower taxes. It always amazes me that these type of statements are made by very smart people. I am sure that you know better and make these generalizations because they help make your argument. But to suggest that no matter where we are on the tax curve if you lower taxes you will get more in revenue or a positive multiplier effect is just fodder. If you lower taxes from 70% to 69% you are going to get a positive multiplier effect but if you lower taxes from 20% to 19% you will not get a postive multiplier. Take it to the extremes, go from 2% to 1% or from 1% to .0001%? What will happen? You will get a negative multiplier. Lower taxes does not always equate to a positive multiplier effect. It depends on so many other factors. Total Tax revenue is a bell curve that will either lead to more taxes being collected or less as you slide down the tax side from 100% to 0. At some point along the tax rate axis as you near zero you will get to a negative multiplier effect. That of course depends on the level of spending and other independent factors. With that said anybody who says that no tax increase is good tax increase is not a reasonable person and should not be allowed to hold office. Everyone who has signed the No Tax pledge of Norquest should be voted out of office. The solution is going to have to be from both a cut or reigning in of spending and new revenue sources. The VAT discussions is worth having but I think the solutions is not going to be such a “radical” concept. It is, in my opinion, tweaking our current system. We need to extend Social Security, Means test anybody who is going to get Social Security, Deal with our Health Care situation, Reduce our spending on the Military (We don’t need a Navy that is larger then the next 13 countries combined) and other concepts to bring down our spending. We then need to address the many tax code loopholes that exist today and make it so that no one pays less then a certain amount in taxes period depending on your income. No one in this country should pay less then 30% or 25% if you make more then $200,000, 15% to 25% if you make more then $50,000 but less then $200,000 and 10% if you are making less then $50,000. We then should do the same for every business in America. No company should be paying less then 20% or 25% in taxes. You hear about how companies will leave the country if we don’t lower the tax rate for them. That is hogwash. It is not right that companies don’t pay for the use of the infrastructure that our government builds and maintains. It is everyones American Duty to pay taxes to make us a strong country. Those that don’t want to pay their share can leave. Go ahead and move your company to Malaysia or India. We are the greatest country in the world we just need to pay enough to keep us that way and then make sure the government is spending it on the “right” things and not wasting it by giving it to people. Feb. 21, 2012, 10:49 p.m.
20% VAT on consumption is an interesting idea. How do you propose to trigger it only on those who make more than $100K? Merchants won’t know that at the cash register. Feb. 21, 2012, 8:03 a.m. I might be wrong but I think that the graph displayed in the chapter “Income Measures What You Contribute to Society” is a wrong one. It displays Employment level and not Private sector GDP. Feb. 21, 2012, 4 a.m. I am dismayed that the level of discourse on such an important topic has dropped to the level of a bad Fox news or MSNBC show. There is no “cure” for the cancer that John describes in his letter. Ther are “treatments” however. As the last 30 + years have demonstrated, the “market” is just as imperfect as the government. We, as Americans, elected the individuals that passed Gramm-Leach Bliley and NAFTA which effectively gutted American manufacturing. The labor unions that demanded unsustainable pensions and benefits had a hand in there as well as did the myopic executives that approved those settlements. That meant that wages stagnated. The plan was to export manufacturing, import cheap products and get us to buy them on credit. We, as Americans, bought in to the dream that all of us can grab that brass ring and become a millionaire. That “dream” was created by the spin doctors for the banks that were more than willing to let us borrow our way to “prosperity”. Does anyone still have a HELOC that they can “tap” into? We substituted easy debt for hard work and innovation. We allowed the banks to tell us that unless we have a great credit score we are useless. Good credit scores can only be achieved with multiple credit lines that are used and repaid regularly. It’s an Orwellian nightmare. The problem, my friends, is us. We were greedy pigs at the easy money trough and now we have to pay it back. Let’s put the blame where it lies…on ourselves. Our parents never would have done what we did. Their work ethic and sense of fiscal responsibility were forged by the Depression and WWII. Ours were by AMEX, Master Card and Countrywide. We have difficult choices to make. We WILL have to ration health care. We WILL have to spend less on education and have larger class sizes. We WILL have to wean ourselves from the hydrocarbon breast and develop methods of transportation that use renewable resources (and not corn ethanol). We WILL have to develop efficient, wind, solar and nuclear power and NOT continue to even mention clean coal. We WILL ALL have to pay our fair share of taxes. We WILL have to do more with less until we can afford it. It’s time to get a glove and get in the game…before the game is no more; and it starts right in our own back yards. Feb. 21, 2012, 3:31 a.m.
One point must be made. We are already in a depression and have been since 2008. By definition in at least 90% or more of Econ 101 textbooks a depression is defined as occuring when a country’s GDP has had a 10% drop in GDP. The USA has been in that situation for the last four years if you take out the excess 10% ( $1.5 Trillion per year) spent by the Obama regime. Next you need to check Shadowstats.com and the Gallop Poll survey for unemployment. 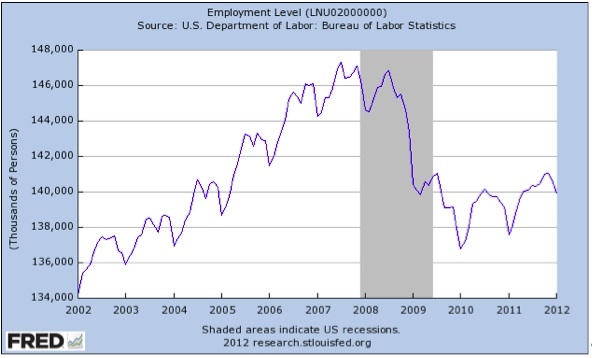 We have been in the 20% unemployment or greater range for the last three years. The only reason there has been no great uproar and rioting in the streets is that the Obama regime has made sure that we increased the lenth of time for unemployment benefits to 99 weeks. Add to that that a huge number of families have been living rent free in their homes for the last three years ( that in itself is a major income subsidy). As to the idea of a VAT Tax , I am totally against it. Lets just control our spending. That is what is going to be forced upon us anyway because we are never going to get the number of votes required to do anything until the next major leg down in this depression. I wish that it were not so, but that is human nature. Yes there are some very good thinkers that would like to get changes done ( Paul Ryan and David Stockman are two of the best). But in the face of going against the Democrats, ABC,NBC,CBS,CNBC,CNN, The Washington Post, and The New York Times I don’t believe we can have success until another crisis hits us. Then people will be willing to listen to reason. Feb. 20, 2012, 7:10 p.m.
Debt crisis in foreign lands will enhance, not inhibit, US borrowing ability. Vociferous complaints notwithstanding, bankers and bond traders still think that the US is the safe haven. Raising taxes will never pay off the deficit. It will only fuel an increase in spending. Witness the 2000 presidential election in which one of the top issues was how to spend the budget “surplus” resulting from the dot-com boom. Feb. 20, 2012, 4:20 p.m. I strongly oppose this view. The US govt is NOT revenue constrained, and therefore is NOT subject to “market discipline” nor is it subject to “bond vigilantes”! The EU is structurally different from the US, so that their member countries have to tax or issue debt in order to spend. They are akin to your states, NOT to the federal govt! Ever wondered why japan’s debt to gdp ratio of 200% is not a problem (as they pay very low interest rates on their public debts) ? because they have a CB and a treasury, they are the monopoly issuer of their currency and their public debts are denominated in the currency the CB issues! exactly as you guys in the US. you don’t have the problem where you can’t service your debt. And you actually don’t need to issue any debt to spend, so the problem of “the bond market loosing faith in the country” is really irrilevant as far as your (deficit) spending is concearned! (for a technical explanation of this latter statement refer to: http://papers.ssrn.com/sol3/papers.cfm?abstract_id=115128 ). Summing up, we must stop treating the public sector finances as households’ or businesses’ finances in a modern economy (with a free floating currency and a public sector which has a monopoly in issuing its own non convertible currency).